The Foreign Corrupt Practices Act "established the first comprehensive prohibition by any country against bribing foreign government officials for business purposes. The FCPA bans the use of bribery to obtain or retain business or to secure any other undue business advantage, and imposes strict record-keeping requirements for public companies. While enforcement in the early years was limited, it has increased markedly since the United States ratified the OECD Convention in 1998. From 2003 to 2007 the average number of new FCPA enforcement actions nearly tripled compared to the preceding five-year period." "In France, Germany, the United Kingdom and the United States, all major foreign investors and exporters and more than 80 per cent of surveyed executives admitted to ‘not being familiar at all’ with one of the most important legal frameworks in global business, the OECD Convention on Combating Bribery of Foreign Public Officials in International Business Transactions. Only a third or so of companies surveyed by other polls in the construction and power sector -- industries with high corruption risks -- had training programs for executives on how to avoid corruption." "Almost 90 per cent of the top 200 businesses worldwide have adopted business codes, but fewer than half report that they monitor compliance. Although more than 3,000 companies have published CSR [corporate social responsibility] reports in 2007, fewer than a third were verified through independent assurance." Enforcement of foreign bribery cases has increased in France, Germany and the United States. "[T]here is still little or no enforcement in . . . Canada, Japan and the United Kingdom." In 2008, France brought 19 enforcement actions and had 16 ongoing investigations; Japan brought one case and had an unknown number of ongoing investigations. Globally, nearly forty percent of polled business executives have been asked to pay a bribe when dealing with public institutions. Half estimated that corruption raised project costs by at least 10 percent. Twenty percent claimed to have lost business because of bribes by a competitor. More than a third felt that corruption is getting worse. "In developing and transition countries alone, corrupt politicians and government officials receive bribes believed to total between US$20 and 40 billion annually – the equivalent of some 20 to 40 per cent of official development assistance." "When corruption allows reckless companies to disregard the law, the consequences range from water shortages in Spain, exploitative work conditions in China or illegal logging in Indonesia to unsafe medicines in Nigeria and poorly constructed buildings in Turkey that collapse with deadly consequences. Even facilitation payments -- the many, often small payments made by companies to ‘get things done’ -- are found to be harmful, as they are funneled up through the system and help nurture and sustain corrupt bureaucracies, political parties and governments." 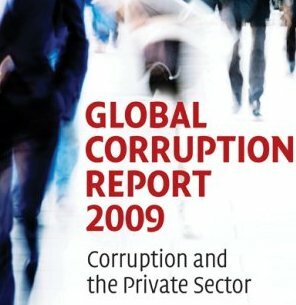 Transparency International's Global Corruption Report 2009: Corruption and the Private Sector can be downloaded here. Disclosure: We acted as a peer reviewer for this publication.